The restless, driven, intensely idiosyncratic life of the poet Arthur Rimbaud reads like a biographer’s dream. After a brief and explosive career as the enfant sauvage of French literature, he gives up writing poetry at the age of twenty-one, becomes a drifter, gunrunner and African explorer, and expires painfully and deliriously in a Marseilles hospital at the age of thirty-seven. It is a powerful and tragic story: a modern literary myth. 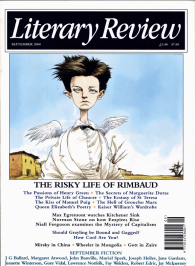 It achieves that status partly because of the extraordinary quality of the poetry Rimbaud wrote in the early 1870s, and partly because his later life seems somehow to pursue the dangerous agendas of the poetry into hard-bitten existential reality. He goes off ‘trafficking in the unknown’ – a resonant phrase from one of his otherwise rather clipped African letters.